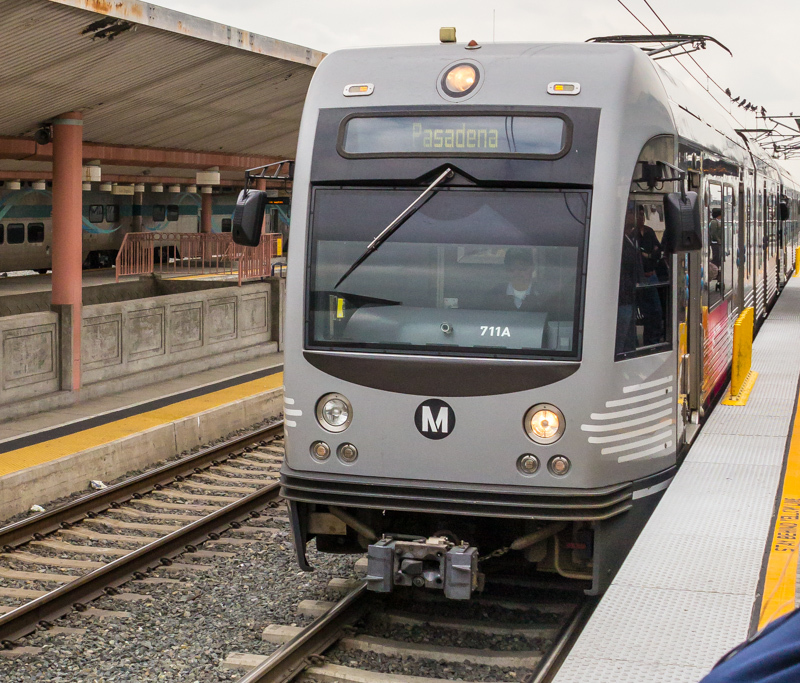 Fine Print: Metrolink Ticket Machines Sell Flyaway Tickets! 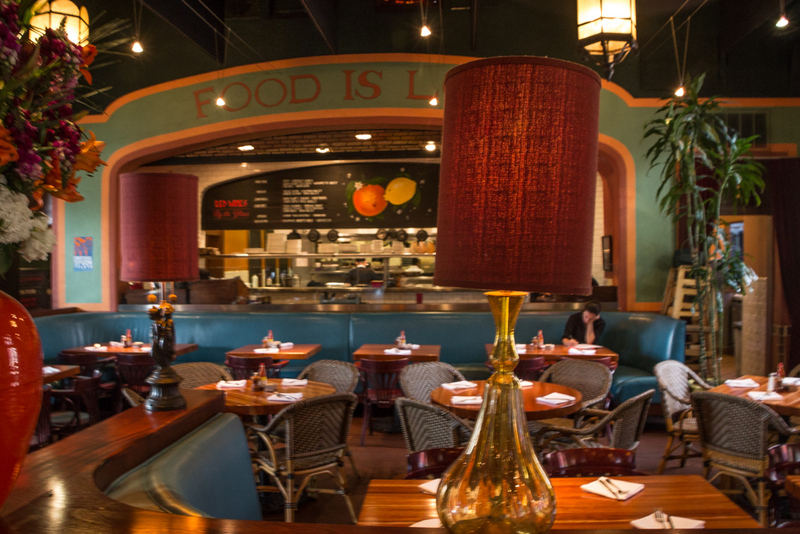 Upper Crust fly from Southern California to San Francisco for lunch, Lower Crust take the train to Greater Los Angeles for lunch. My rail-buddy, Don Roe, and I wanted to have lunch together and why not take a train ride also. 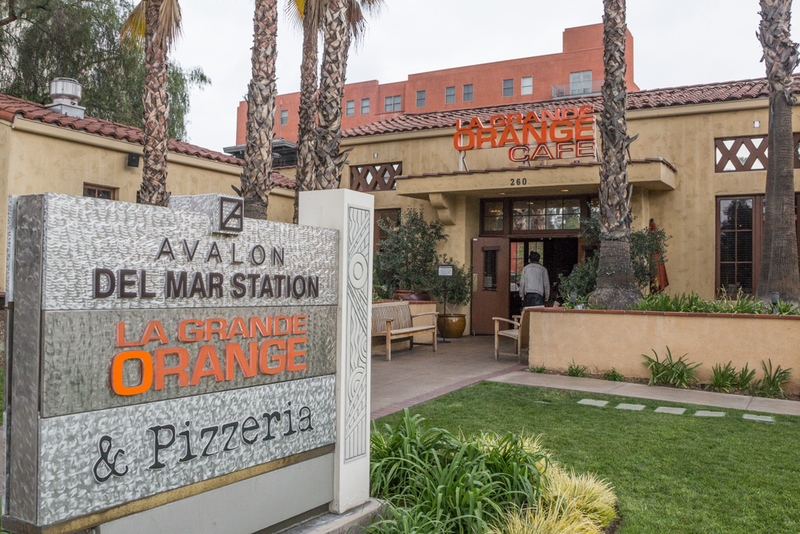 We decided to do a short trip we had done before - Pacific Surfliner from Fullerton to Los Angeles and Metro from Los Angeles Union Station to Del Mar Station. Metro from LA to Del Mar Station in Pasadena, loaded my Tap card for $1.75 for one way. Return from Del Mar Station to LA another $1.75. Using the garage on the west side of Harbor Boulevard, with stairs directly to the walkway over Harbor, I heard a freight passing as I stepped out of my car on the top level. 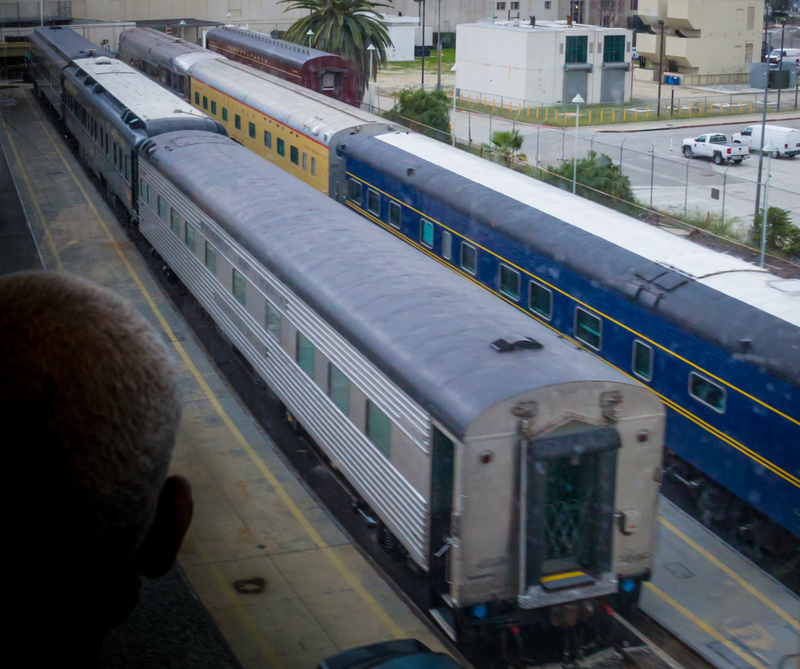 Top level of the Parking Structure next to the track at Fullerton station is a nice place for photos of passing trains. View from the top of the Fullerton parking structure eastward to the Amtrak Station marked by the pedestrian bridge. Our train a little after 9 was single-level. Less stairs, but the first one is the highest. The cabbage-car number looks like a California ZIP Code. Sitting on the right side gives you a nice view of the many classic bridges crossing the often-dry Los Angeles River. On this day, there was water in the river. Tracks of arriving trains that do not dip down to Fullerton cross the LA River here. We arrived from the south. Mission Tower - tracks into LA Station to the left, tracks up river for northbound trains past the red signals, tracks eastward go across the river. 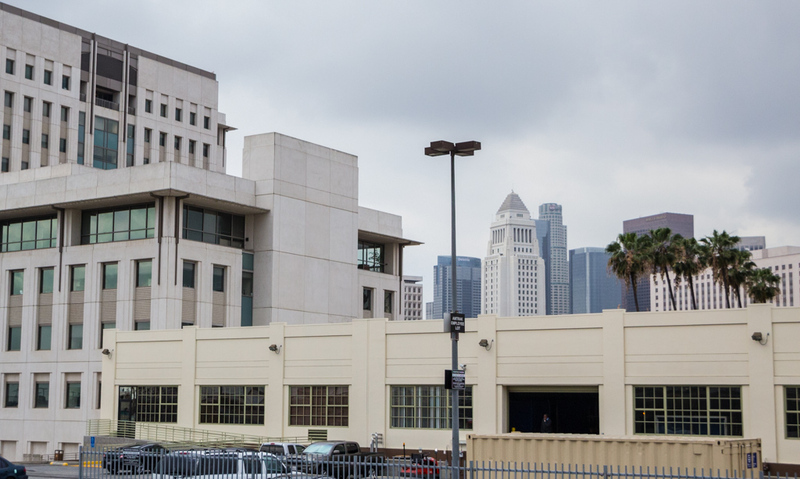 Run through tracks are planned for the LA Station. The Garden is a place for private cars just northwest of Union Station that you can see on the right side as you enter the station. The Salisbury Beach is one housed there. You can get an elevated view from the Metro line to Pasadena. Rather than taking the tunnel immediately, we walked around the south end of the platform. 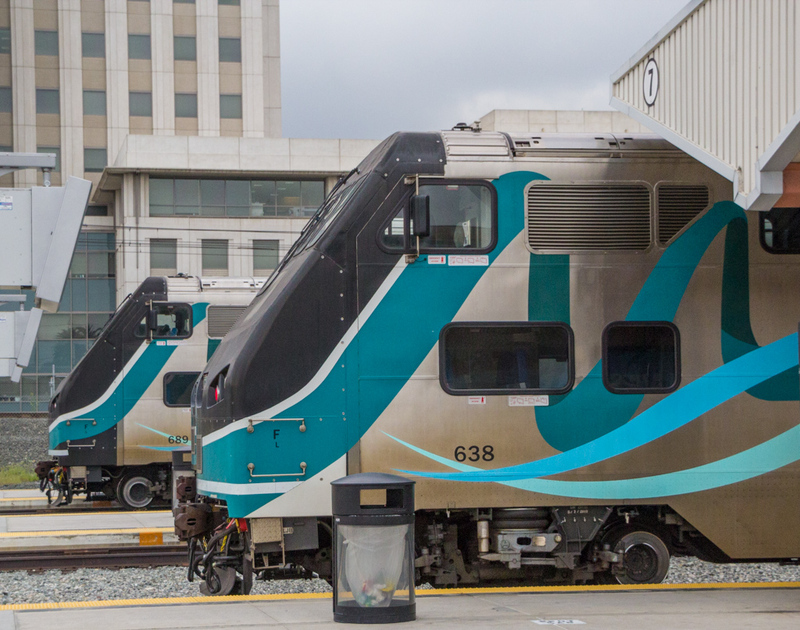 These are the new type of crash resistant Metrolink cab cars that have been developed since the fatal accident with the earlier models. The most recent Metro accident when a truck and trailer made a turn down the tracks near Oxnard and a Metrolink train could not stop was this type of cab car. It is said that lives were saved because of the use of these new cab cars. 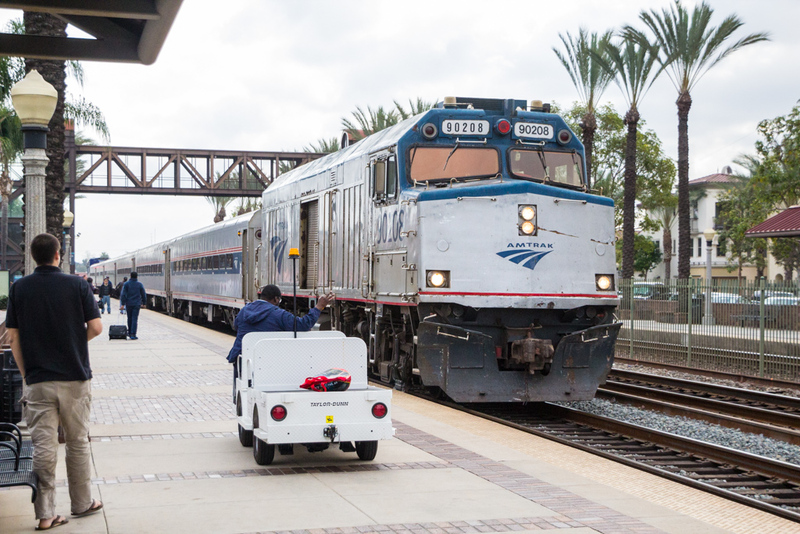 The Coast Starlight was ready for its northward journey to Seattle on the adjacent track. 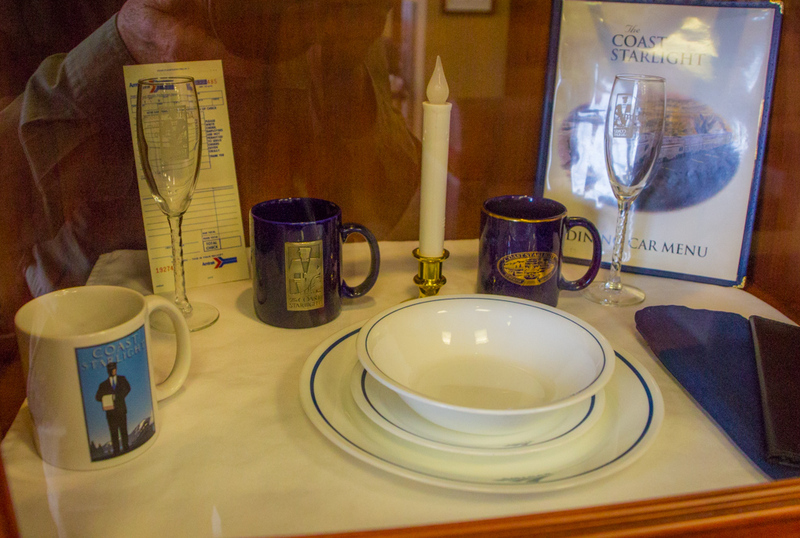 Since the Pacific Parlour Cars have been taken off the Coast Starlight to be refreshed, I wondered if they were back in service yet. 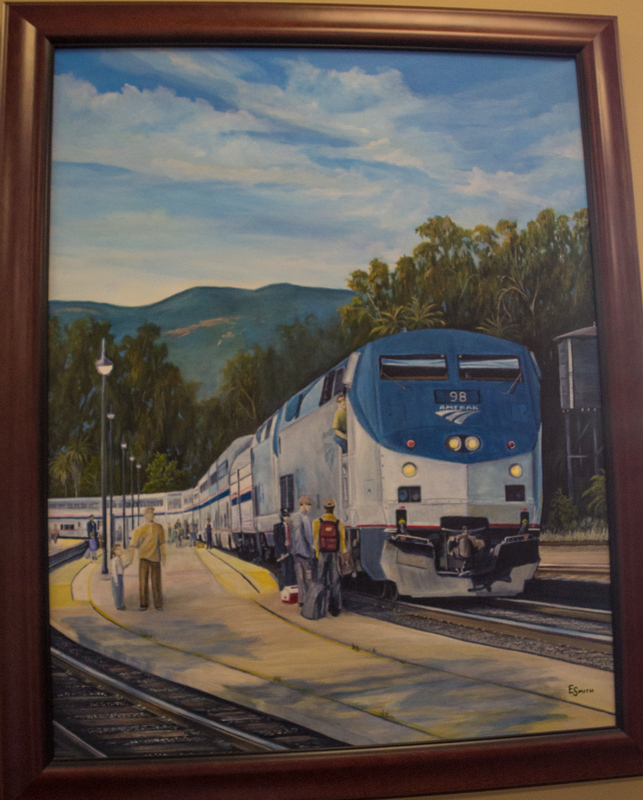 I am taking the Coast Starlight to Sacramento for the California Passenger Rail Summit in April 28 and 29, 2015, and would like to have the services of the Pacific Parlour Car on that round trip. 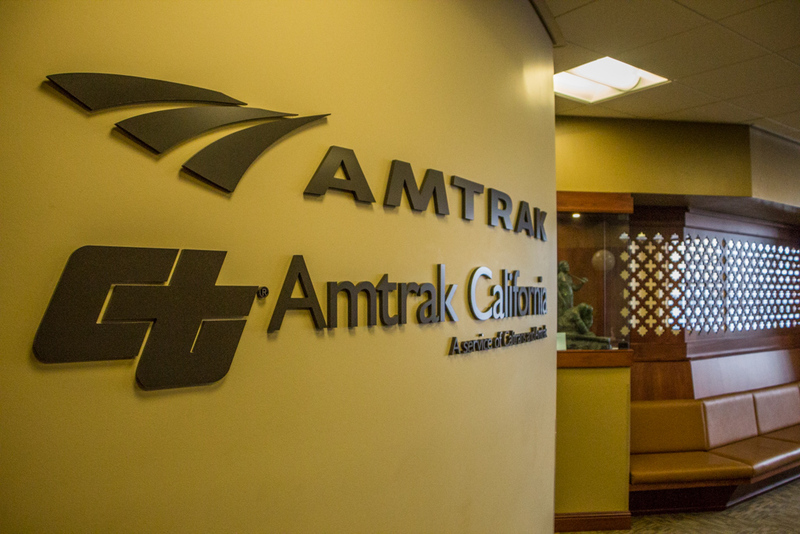 The second Amtrak employee I asked about the expected return of the Pacific Parlour Car said, "March 13 or 14." If this is true, they will be back in time for my roundtrip to the California Passenger Rail Summit in Sacramento. 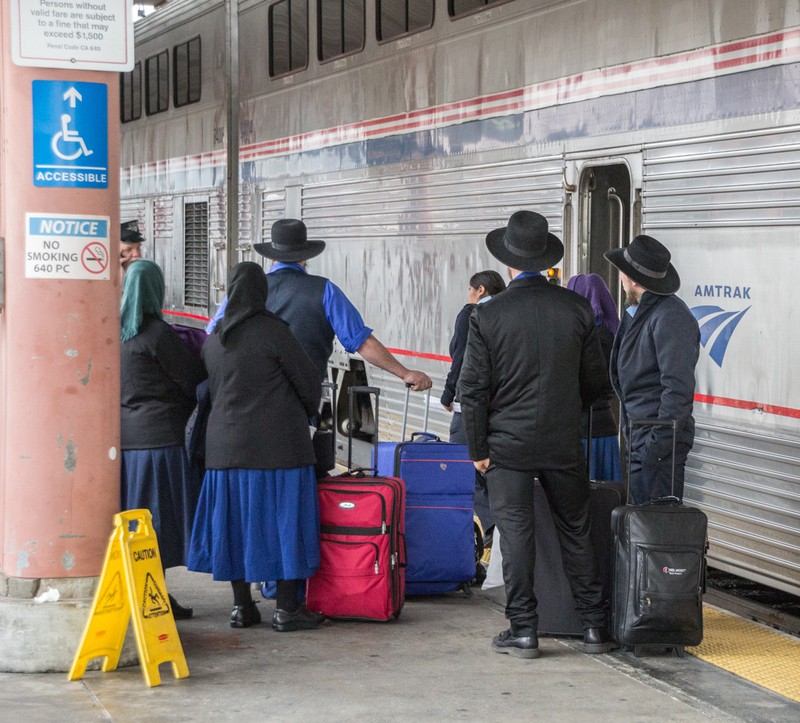 Amish awaiting boarding time on the Southwest Chief. There was some concern on the conductor's part about their not having photo IDs. 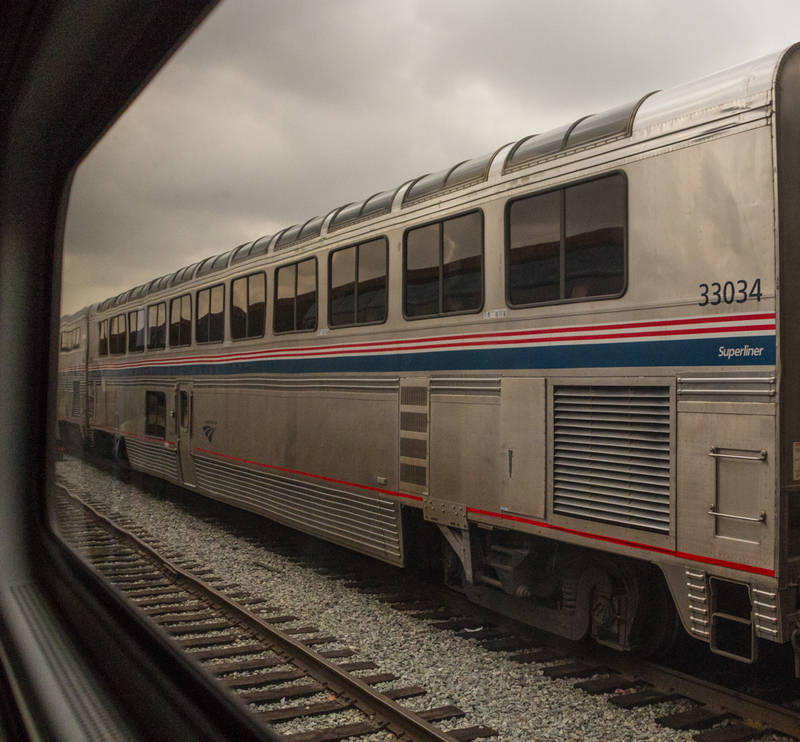 In talking to Amish train travelers on the Southwest Chief in the past, I asked, since they do not allow photographs of themselves, how they bypassed that requirement and they responded that they carry their birth certificates. 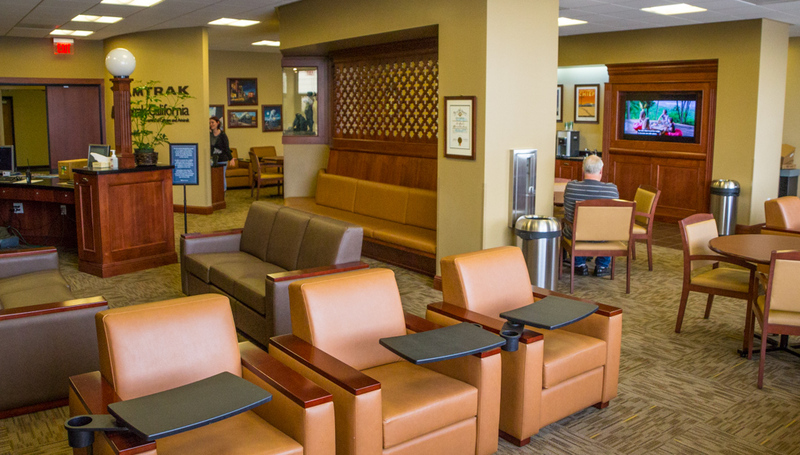 Since we will be using the new Metropolitan Lounge on our trip on the Coast Starlight in April, I thought I should find out where it was. We walked through the tunnel west and at the end of the tunnel, turned left toward the car rental desks. 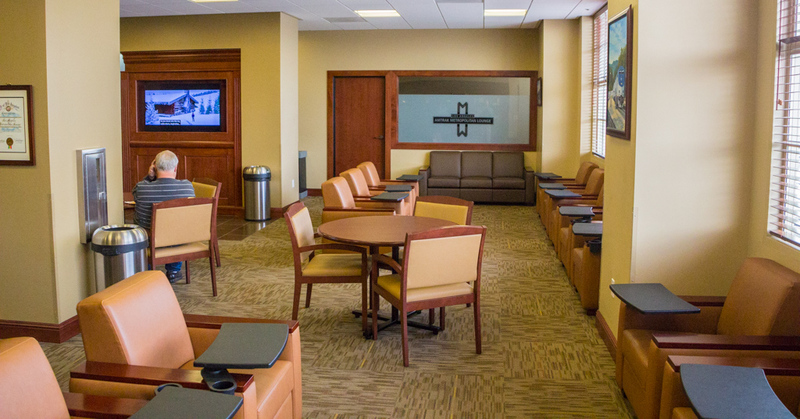 To the left of those desks is an elevator and stairs to the Metropolitan Lounge. 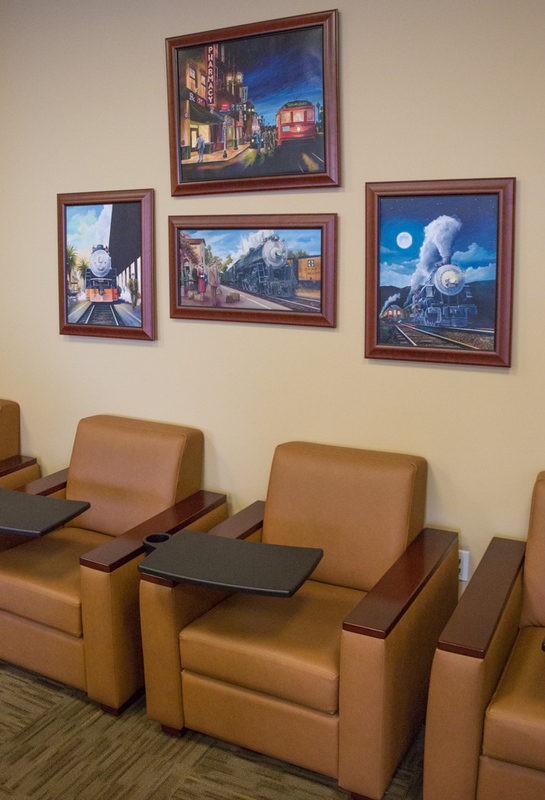 All the oil paintings in the lounge are by Eric Smith. 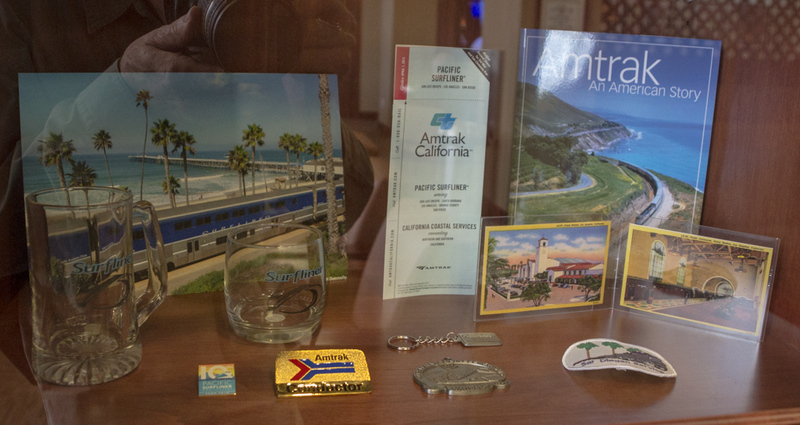 There are also some nice displays of Coast Starlight and Amtrak china and souvenirs. 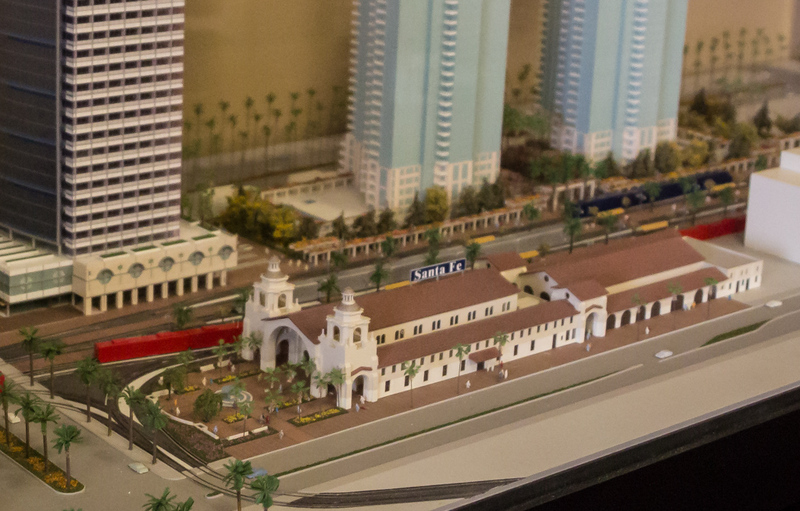 A large model of the San Diego Santa Fe Station. The exit from the Metropolitan Lounge is down a ramp to a Red Cap and cart to your train. 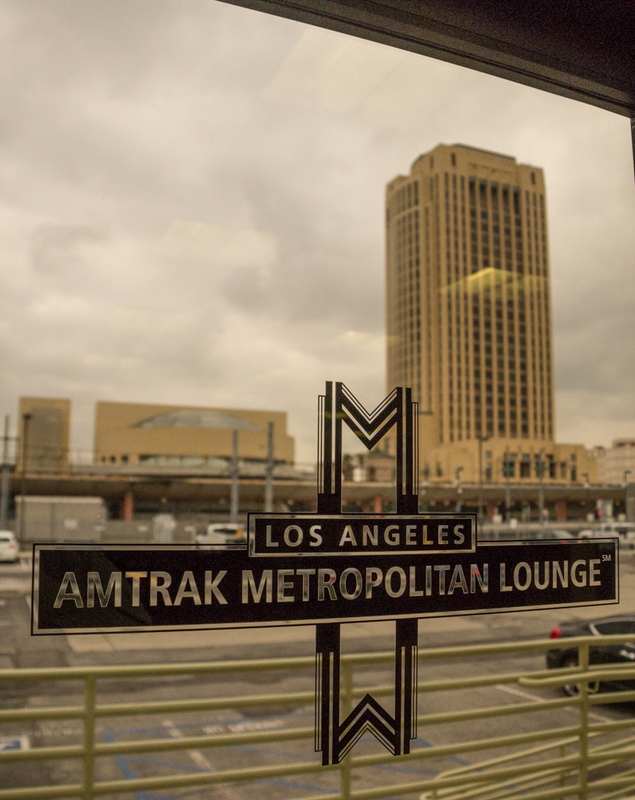 From the platforms, the Metropolitan Lounge is not marked, but it is the leftmost window of the cream colored, one-level building, with the handicapped ramp. 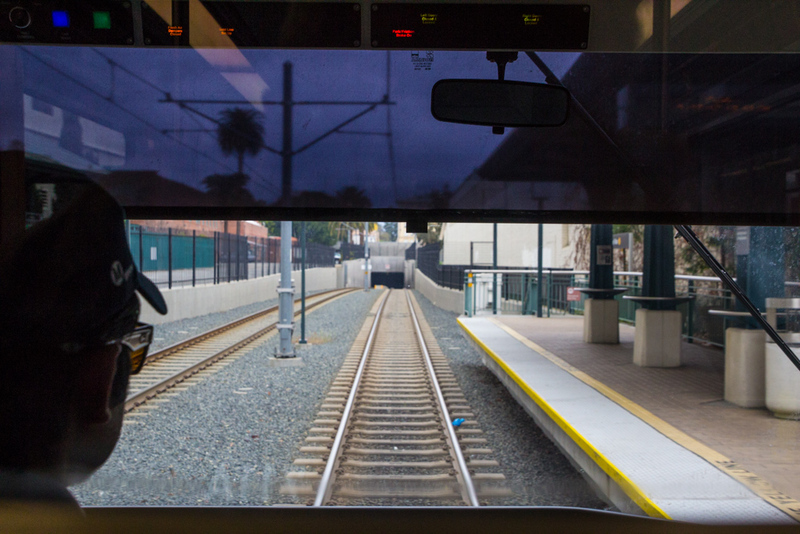 Since we were in the first car, as we stepped off at Del Mar Station, I took an engineer's-view toward the tunnel ahead. On the Del Mar platform is a map of the Metro System. 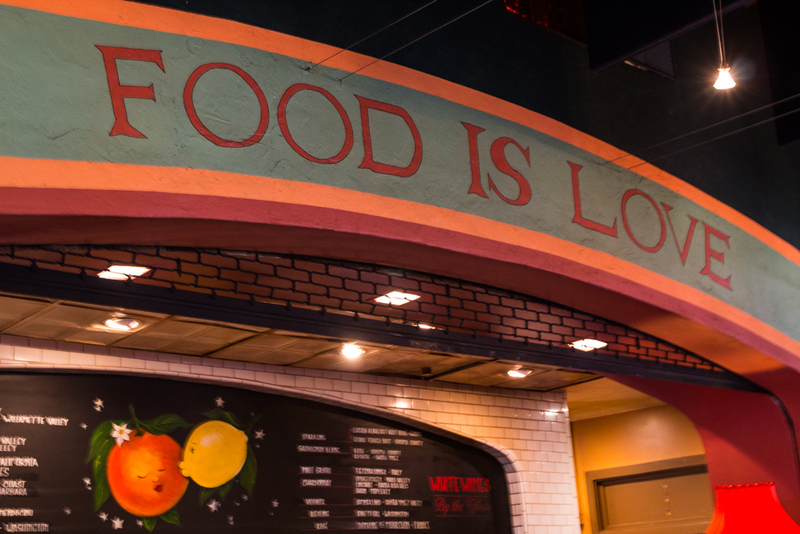 Our destination, the La Grande Orange Cafe (LGO). This is the street entrance. 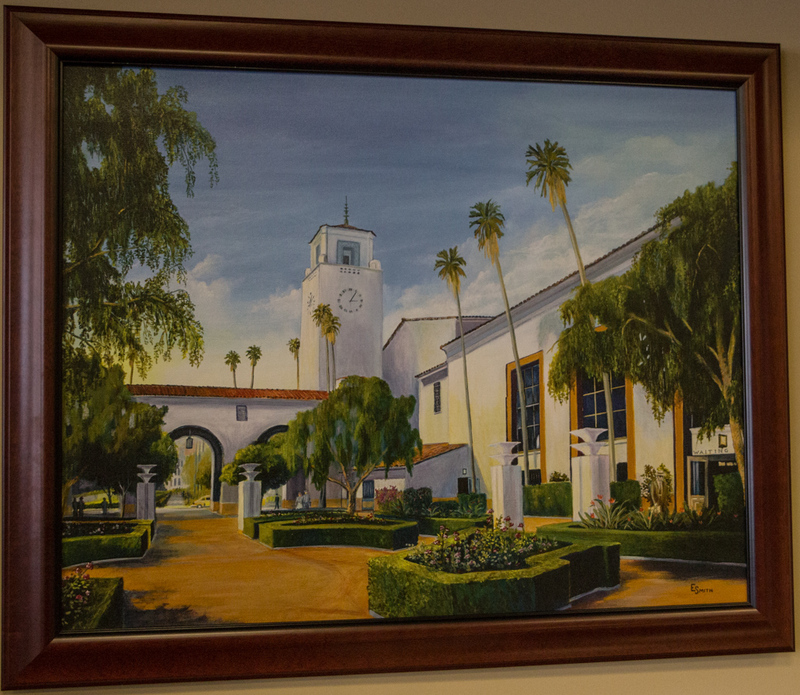 Metro Station side of LGO, an original Pasadena Depot. The Pasadena Depot became well known by the many transcontinental passenger trains that it served. 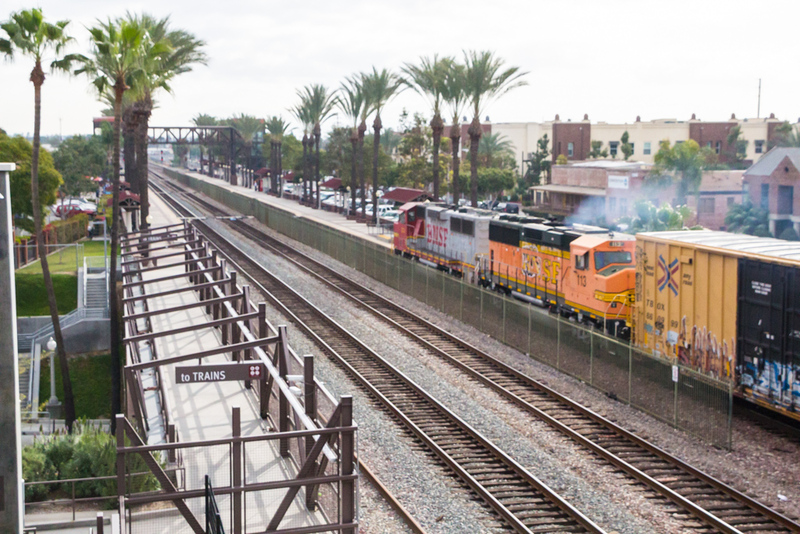 Historically, up to 26 passenger trains went through Pasadena every day. 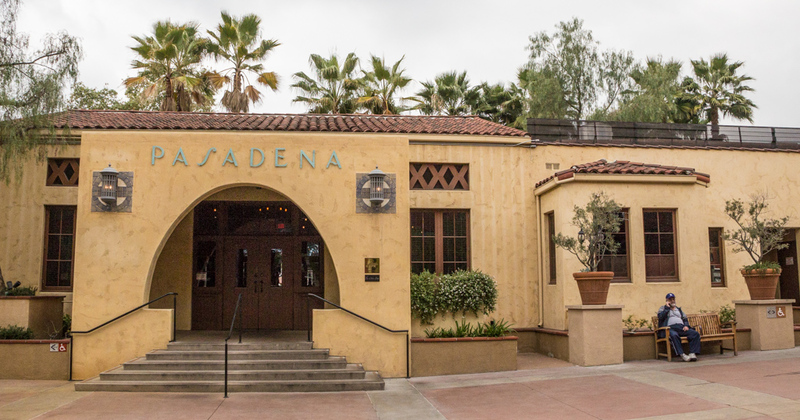 In order to avoid the media in Los Angeles, many celebrities chose to use Pasadena as their main train station, bringing to it an ambiance and legacy of the glamor of old Hollywood. We walked north on Raymond Avenue from LGO, looking for a bookstore. 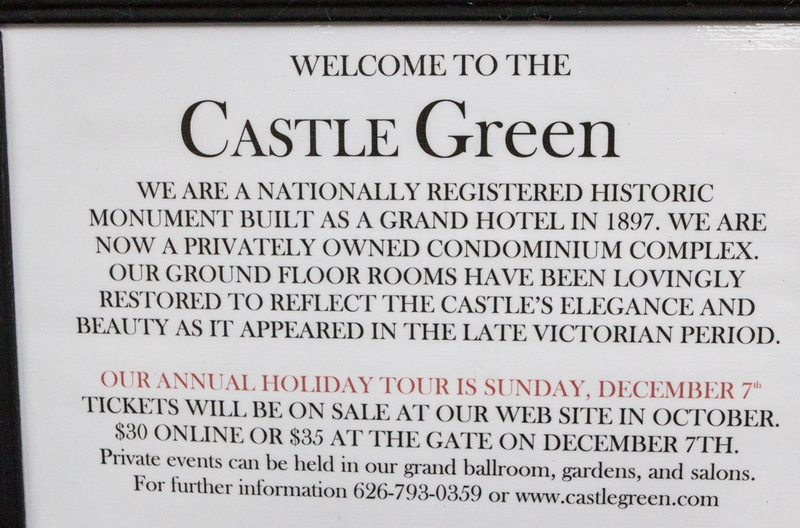 I love the architecture of the Castle Green, a popular hotel for railroad travelers in the day. 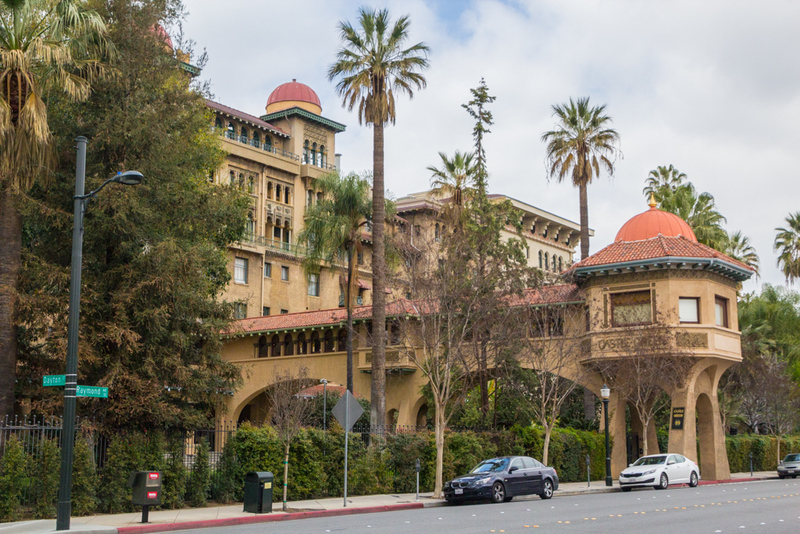 Frederick I. Roehrig blended domes, arches, pillars, balconies, and verandahs in a building of structural steel with brick walls and concrete floors, making it Pasadena’s first fireproof building. He tied it to the first part of the hotel complex, built on the east side of the street, by an ornate enclosed bridge crossing Raymond Avenue. When the Annex opened for business, its two cylindrical towers on the south and much of the roof line were illuminated with exterior lights. There was even a penthouse garden with a glass roof. 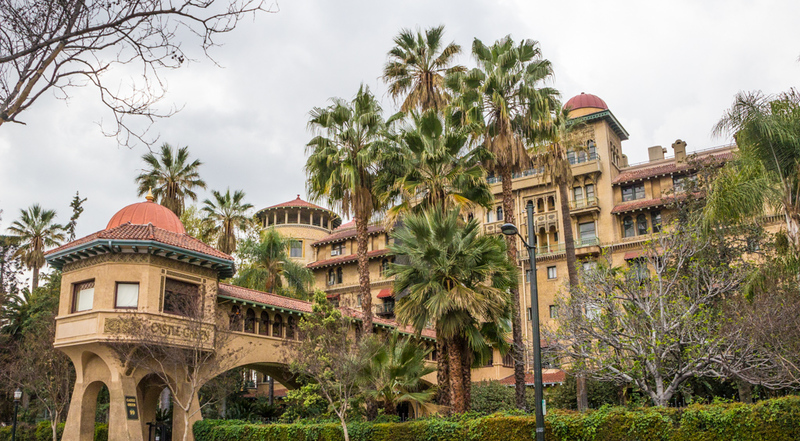 The Hotel Green became the social center of Pasadena, playing host to vacationing tycoons and even presidents. It was also home to both the Tournament of Roses and the Valley Hunt Club. At the end of the resort era, the west annex was purchased by a group of regular hotel guests who wished to continue to come to the Hotel Green. In 1924 the group of investors divided the hotel complex into three parts. The Central Annex was divided into fifty individually owned units and so it remains today, renamed the Castle Green. 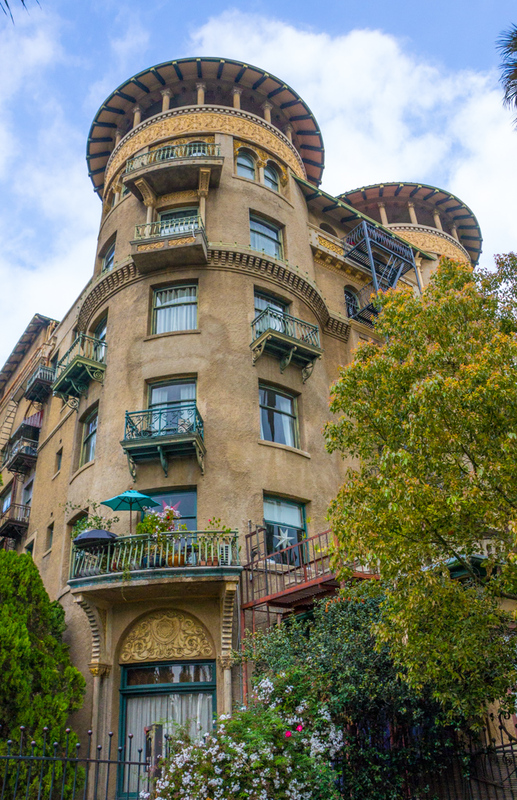 The Castle Green is an imposing seven story Moorish Colonial and Spanish style building sitting next to Central Park in Old Pasadena at Raymond and Green Street. 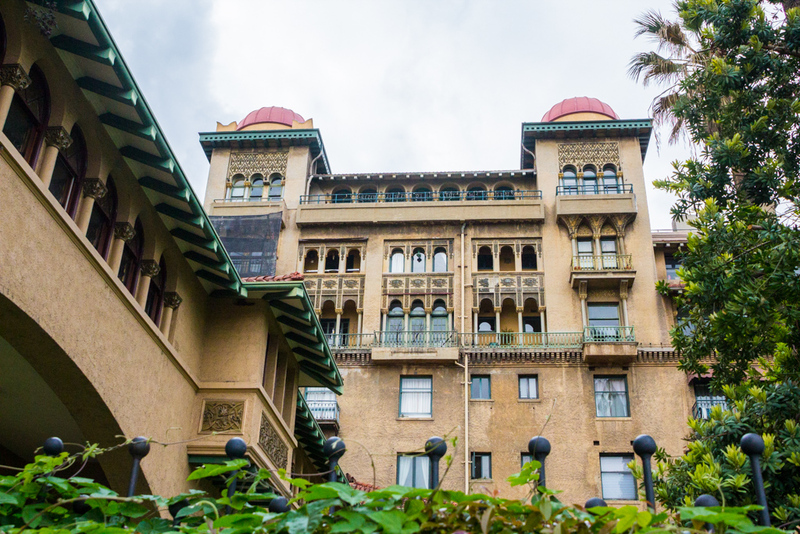 The Castle Green, opened in 1899 as the second of three buildings in the Hotel Green complex, was a lavish resort for easterners and others escaping winter rigors. In 1887 one Mr. E. C. Webster began construction of a hotel on the southeast corner of Raymond Avenue and Kansas Street (1929 Green St.) When he was unable to complete the job, a newcomer to the area, Colonel G. G. Green, took over the construction and finished the Green Hotel, which opened in 1888. Green was a friend of Mr. Andrew McNally, a prominent printer from Chicago who had moved West and made his home in Altadena. McNally had invited Green to come out and join him in this new community. Together Green and McNally invested heavily in the short-lived Altadena Railroad, which provided them private sidings at their residences and which Green rode daily to the construction site of his new hotel. Green and Andrew McNally were next door neighbors on Mariposa Street just west of Lake Ave. The McNally home still stands and the old Green Carriage house remains and can be seen from the rear parking lot of the Altadena Library, which stands where the Green house stood. The old Green carriage house is currently occupied as a residence. The new Green Hotel was a mammoth 6-story edifice that faced Central Park on South Raymond, just north of the original Victorian Pasadena Train Station, where trains stopped on their way between Chicago and Los Angeles. That station was replaced by the current station, in the Southwestern style. 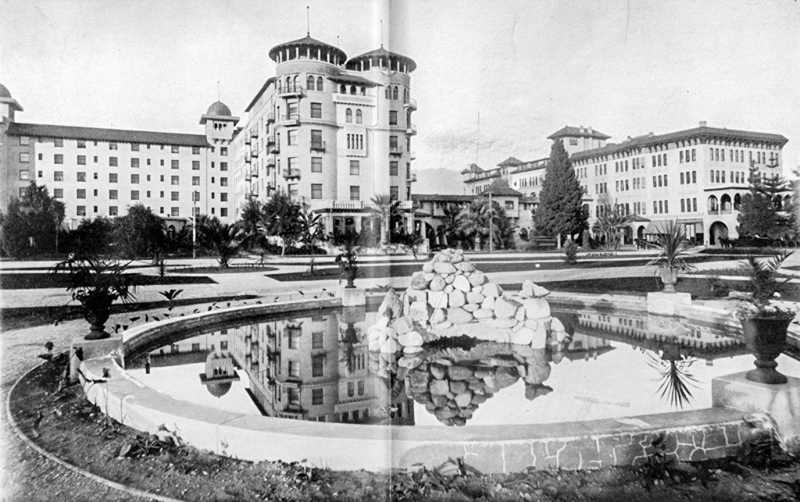 In 1898, Green built an even more impressive Mediterranean style hotel on the opposite side of Raymond. The first became referred to as the annex, and the second became the winter home for some of the most prominent magnates of industry in the Eastern United States. The two buildings were connected by a bridge across Raymond, and a tunnel under it. Guests arriving by train would pass through the annex, to the second floor, and be trammed across the bridge. In the main residence they would simply retire to their suites. The luggage would follow via the tunnel. Many of the servants and attendants of the guests were forced to find quartering in the adjacent buildings. In 1902 the Green had a wing built along Kansas (now Green Street) to the P. G. Wooster Block, home of Throop University, (forerunner to Caltech). This was all run as the Hotel Green. In 1924 the Hotel converted to all residential apartments. The original building (annex) was razed to its first floor. All that is left of that original hotel is a portico on the corner of Raymond and Green. The building is now owned by Stats Floral Supply. In 1970 the government's HUD project acquired the 1902 wing and separated the buildings into the Green Hotel on Green and the Castle Green on Raymond. 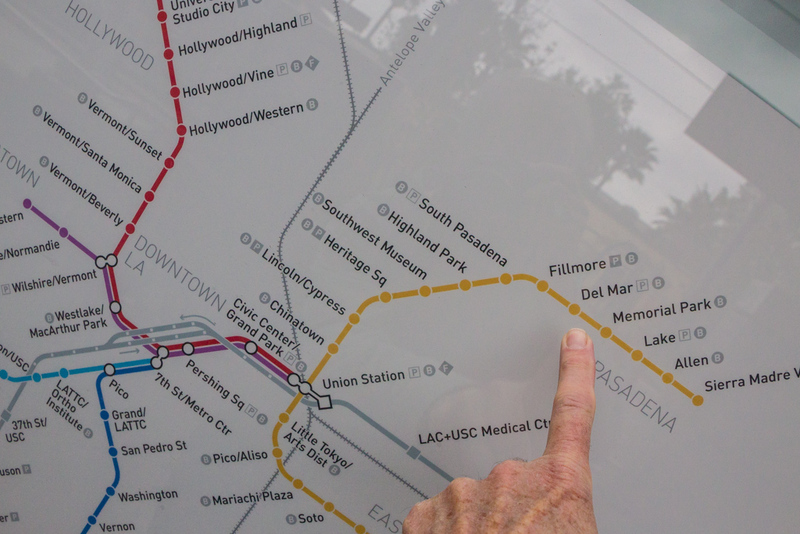 We took Metro back to LAUS and had so much time before our 3 pm Amtrak back to Fullerton that we decided to take Metrolink instead. 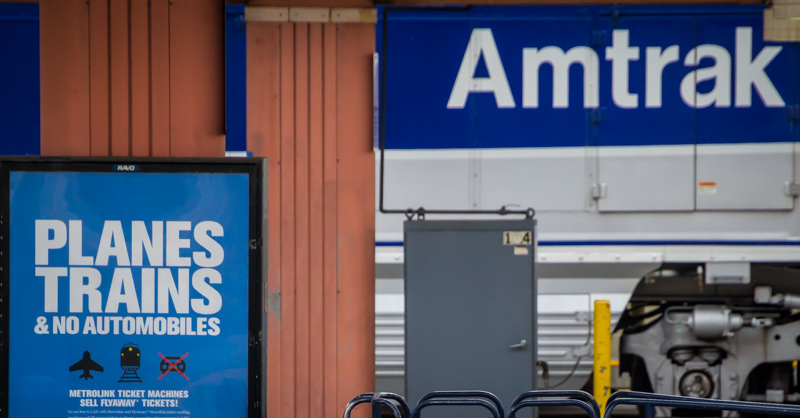 My Amtrak Senior ticket to get to LA was $10.20, my Metrolink ticket to get back to Fullerton was only $4.25. 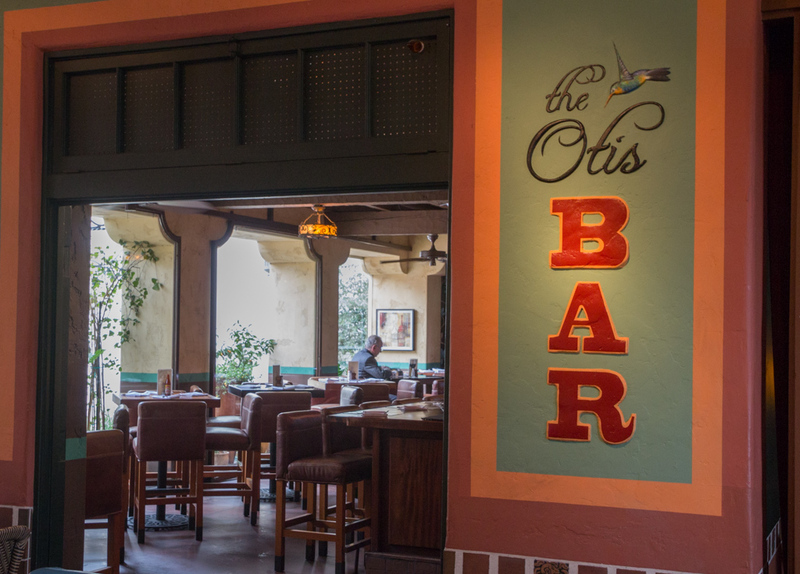 Our day of taking the train to Pasadena from Fullerton for lunch had been a great success.